Artificial grass is an extremely versatile product. When installed correctly it can be placed in all manner of places from the flooring on rooftops to the covers on seating. It can even be used to make shoes. In this article we will show you how to lay artificial grass on a balcony. In general we find that installing artificial grass on balconies is a relatively straightforward task. Most balconies have suitable flooring made of concrete, are relatively flat and have good drainage – an ideal surface on which to lay your artificial turf. There are always exceptions to this. Here is what you should be checking on your balcony before having a new artificial grass covering. What surface are you intending to lay the grass on? Such is the versatility of artificial grass it can be laid on concrete, paving, brick, wooden decking or just about any hard surface. If laying on wooden decking make sure there are sufficient gaps between the planks otherwise the wood will rot. Artificial grass shouldn’t be laid on an uneven surface, as pockets of air will form in the grass creating an uneven look. If your surface is uneven we recommend using a 6mm foam underlay. If you have a flat surface laying artificial grass directly on to it shouldn’t be a problem. What size is your balcony? If you have a very large balcony we suggest placing an artificial grass shape (square or circle) on just part of the balcony. This prevents a ‘green overload’ and also gives you the chance to break up your balcony into different areas. You may for instance have a garden flower area and a BBQ eating area and a games area. Does your flooring have good drainage? If your drainage is poor pooling of water is likely when it rains which is bad for the artificial grass backing. The only remedy for this is to sort out the drainage before laying the grass. Installation of the artificial grass on the balcony is similar to the installation of the grass on the garden lawn. The main difference is that we don’t have to do any ground works, but installing the end product is generally the same. We use joining tape where possible when joining the grass as we want to put as little glue onto the balcony as possible. To secure the grass in place we will only use glue around the perimeter of the area making sure to leave gaps in the beading for drainage. We also take special care to fasten the grass around entrances to prevent trip hazards. Too much glue underneath the grass will stop water free draining under the product and also will make it very difficult to lift if required. When we fit onto a timber surface we will nail around the perimeter rather than glue as the glue will break away from the wood. 3. How long will it take to install the artificial grass on my balcony? For the average sized balcony we can install the artificial grass within half a day. Depending on the time of year you will be looking at between 1 to 3 weeks to get a booking. If you have a small balcony it is fairly easy to lay the grass yourself and you can request delivery only. 4. Which type of grass do you recommend for balconies? Like anywhere else it is dependent on the useage of the area. If you foresee your balcony having a lot of footfall we recommend a grass with a shorter pile such as the Outfield artificial grass. If however the balcony will only receive a limited amount of use and you want the most realistic product we offer then go for the Heath artificial grass. 5. How long will the artificial grass last for on my balcony? We have been installing artificial grass for 12 years. We still have installations that are looking great to this day that we did when we started out. 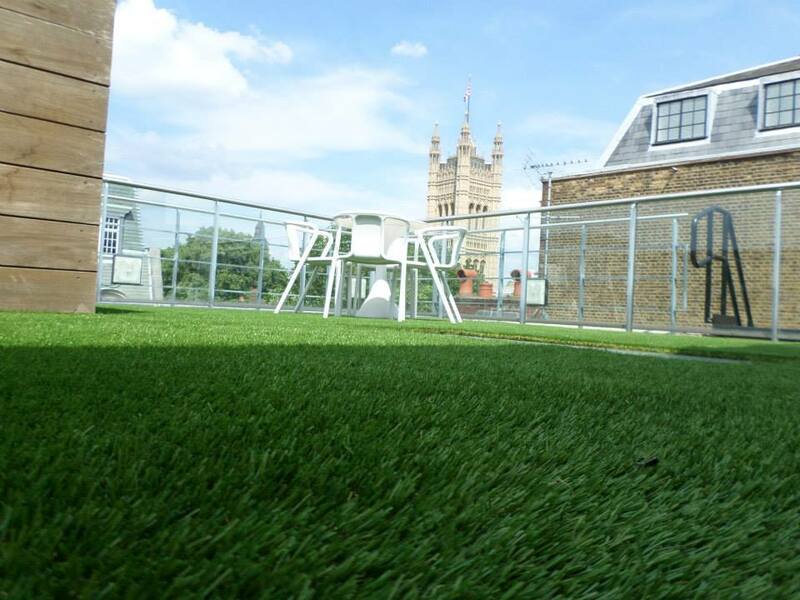 It really comes down to how often the grass is used but we are confident that with average useage our artificial grass will last for up to 15 years when installed on a balcony. 6. Roughly what sort of cost would it be to install artificial grass on my balcony? You will be looking at approximately £500 for the grass and installation including VAT. The work should take no more than half a day. Hopefully by following this guide you will have a better understanding of how to lay artificial grass on a balcony. I also have a more basic guide on installing artificial grass you may wish to look at. If you want to lay the artificial grass yourself take a look at our measuring guide and then order your grass from us. It will arrive in a roll that you will then need to cut to size. If you would like us to install the grass for you please call me Gavin Hall on 020 81664168 for a no obligation quote. Can you lay artificial lawn on to a flat roof made of GRP? or is there a preferred roof covering? Hi there sorry I am not familiar with GRP? I would ask the roofing company as it will be down to how it reacts with the adhesive. I have a large roof terrace on the 4th floor in Bromley. The building has a slight curve to it so there are no true lines. There is clearly an area which is sagging in the centre although this does not cause us any problems with drainage. The floor is small paving slabs but my main concern is that we get incredibly strong winds up there which have now prevented me from putting any live plants out, aswell as direct sunshine all afternoon and evening (SW facing). Have you ever had instances of turf lifting in strong wind, and if you did the installation would you come and repair in such an instance orwould we have to pay again? I live in a rental. How easy would it be to remove the turf if we vacate leaving the balcony in original condition? Hi very easy if you do not glue it , simply add weight to the corners and cut to size. You can add extra weight by adding kiln sand but makes it slightly more difficult to lift. Could you advise on the best way to use artificial grass on a small metal floored balcony. Drainage is good as it slightly slopes to one edge. Metal floor has non slip slightly raised lines in a grid pattern. Hi there you can simply cut the grass to size using a Stanley knife with hooked blades, then lightly stick around the perimeter leaving gaps for the water to escape. Please note the glue is extremely strong and will mark the metal if you ever want to remove it. If you wish to add an underlay you can buy 5mm and 10mm underlay suitable on line, however you will still need to fix the grass around the edges. Please can you help! we have large roof top balcony. We are applying marine boards than fibre glass to make water tight balcony which is also ceiling to basement room (good drainage around 4 inch slope)water will go to gutter. Please also do you think fibre is the best method to make it water tight. Can I now lay artificial grass on it directly or do I need something in between the fibre glass and the grass for better drainage so grass and fibre glass don’t stay damp. My worry is the fibre glass and the back of the glass will stay wet and smelly due to the damp. Hi there. This isn’t something I have every used. We have laid on marine ply before, the problem is the water gets in between the ply where it is cut. The fibre glass may protect this but it can also warp in the sun and doesn’t stop water getting inbetween the cut edges. If you do go down this route when you fit the grass only lightly glue it to the fibre glass so the water can escape. We’re looking to put artificial grass on a balcony and just wondering if the best product is the tile type for drainage or rolling out the turf style strips? Hi simply buy the correct size off the roll to fit and cut to shape. You may be able to find an offcut if the area isn’t too large. Do not over glue, just very lightly in corners so water can escape. We have a small first floor balcony 2m wide x 2.6m long with good drainage falling to a gutter. It is covered with asphalt which is in good order and watertight. At present there is timber decking on the balcony which we will take up. We have a depth of about 65mm from the bottom of the door sill to the asphalt. Will the glue affect the asphalt if we glue around the perimeter? Also will the grass dry out quickly after rain or will it remain damp for many hours? Hi there as long as the asphalt is in good condition and does not puddle. Apply a light glueing around the perimeter leaving one foot gaps, every foot or so, which will allow the water to escape. Do not glue too heavily around the gutter and don’t forget if there is a problem you may have to get the grass up, so as little glue as necessary. One other point cut the grass folded over to the backing so you do not score the roof! What sort of underlay would ensure good drainage on a wooden terrace? We only have 3cm clearance under french doors, so were looking at a 6mm underlay like this . Is this good enough? Hi there I personally don’t think you have enough depth for an underlay if you only have 30 mm you will only be able to put a 25mm grass on it . The underlay we used to use was from Hitech but the drainage was poor (it only drained between sheets and not through it) . Why do you need underlay are the deck boards wide ? You may then want to consider taking up the deck and using some marine ply if this is the case , however it will be expensive to do it this way. If the deck boards are in good condition and not too far apart I would simply lay on top. Hi we never use glue when fixing to a deck etc as the glue is so strong it simply breaks the timber and pulls away after a while. Simply nail it into place using 3/4 inch nails with small heads. We have a balcony (roughly three and a half metres by three and a half metres. It stands on what is the flat roof of an extension but is all properly constructed to hold a balcony . It is covered in Firestone Rubber roofing so naturally we would not wish to puncture it or stick anything to it. Would it be feasible to use a good quality artificial turf and roughly what would be the cost for supplying and laying it? Hi there you would have to work out how you wanted it fixed. Gluing can be done in small amounts however if you need to get under the roof for any reason it will cause issues to lift. The only other way would be to top dress the area with kiln adding weight, however you would need to be sure this is ok for building regs. The area is very small and personally it wouldn’t be cost effective for us to fit. It is definitely stimulating to read material from other authors and learn something from their blog. I appreciate you taking the time to share this info, I love reading more on this. We have a balcony that we are looking to lay artificial grass on – the flooring of it is wooden slats. When it rains would this cause excessive water to pool and then drip more than usual through to the neighbor below us? Hi there Im afraid you are going to have to resolve that issue before even considering artificial grass . The slats would need resolving and the drainage problem resolving before replacing either the slats or marine ply to fit your grass on top off. Our balcony is tiny – only about 3m x 2m. We have a slight problem with the drainage though – the drain bit is at the highest point. Is there some sort of deep plastic mesh that can sit underneath so that we can still step on it when the balcony hasn’t completely dried? What sort of price would we be looking at for the grass (delivery only)? Thank you! Hi there , unfortunately you will need to address the drainage issues first. I would suggest using a self leveling compound to sort out the dips so water can flow towards the drain .The grass will squash down onto the surface whatever you put under it and anything like a loose aggregate will simply wash away .Grass wise unfortunately it would not be cost effective for me to deliver a piece that size , however I do have offcuts for £50 for that size which can be collected from our yard in Bexley. I have measured my balcony. Can you give me the price of the Outfield artificial grass please? I have two small dogs and I’m concerned that they will think that it is acceptable to pee on it! issues if the dogs are allowed to go out there as they think its a grassed area and the wee can not escape. My advice would be to keep them off if you are going to get this done. Could you give me an estimate for supply only. It’s for s rugby club balcony. The size is 8 meters x 5 metes. It would need to be fire proof. Also is it posible to have white lines on it to give it a pitch feel. Hi there, I do not sell a product with lines. They have to be but on after (this isn’t something I get involved in). Prices would start from approx £720 inc vat ex delivery.